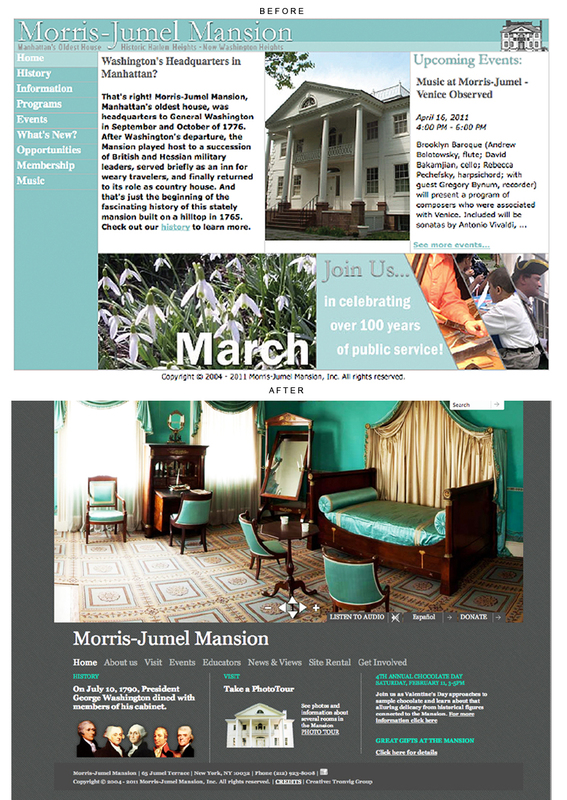 We just completed a branding and website project for Manhattan’s oldest house—the Morris-Jumel Mansion. Morris-Jumel Mansion had a website that was a few years old and was no longer serving their organizational needs. Tronvig Group won the bid to update the museum’s website based on the idea that the website could do a far better job of communicating the unique value of this one-of-a-kind historic institution, and that the best way to do this was by creating a more engaging and immersive preview of the experience of actually visiting the museum. Working with the photographer Dave Diesing, we developed a much more dramatic visual language for the brand, and designed a website that offers an inviting and visually engaging initial encounter with the Morris-Jumel Mansion. We believe that the new website previews the experience of visiting the Morris-Jumel Mansion Museum without “over showing” it or leaving the impression that the web experience is somehow a substitute for actually going there. We also believe that the new website will effectively help convert web visitors into museum visitors. That’s pretty much exactly the response we wanted.